Damn, GLORY 11 Chicago keeps getting more and more stacked as the time grows near. GLORY 11 Chicago is set to be GLORY’s debut live on Spike TV and will feature a Heavyweight tournament featuring some of the best Heavyweight Kickboxers in the world. 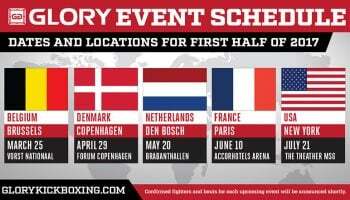 We already know that the tournament is Daniel Ghita, Gokhan Saki, Anderson Silva and Rico Verhoeven, but today they unveiled the Reserve bout for the tournament, which is Errol ‘Bonecrusher’ Zimmerman vs. Hesdy Gerges. For kickboxing fans this is an interesting bout, as Zimmerman was one of the top Heavyweights in the world until he ran into Semmy Schilt in 2012 and Hesdy Gerges shot up the rankings a few years ago with a disqualification victory over Badr Hari, but kept winning big fights to prove that he belonged there. Both guys have had a checkered last few years, but are worthy Heavyweights with exciting styles. Gerges is a kick-heavy fighter with some very good defenses while Zimmerman is an incredibly powerful puncher who has been known to get sucked into some wild brawls. Both men have had some incredibly entertaining fights over the past few years, but have never met in the ring before, making this fight a big deal.